Oh prudent friends, I am sure you are aware of the adult coloring trend? I have yet to be enticed into using a coloring book to excise my creative demons, but I understand the draw. There’s something meditative about taking pen to paper and just making something, but (at least for me) the idea of staying between the lines does not appeal. Hence, the discovery of gel pen doodling has awakened me to a whole new world of mindless creativity. And by mindless, I just mean that it doesn’t require the kind of attention to detail that the usual crafts we share warrant. If you have a truly good gel pen, you can doodle endlessly and the results are magical (no smudges, no smears, bright colors, smooth lines). That’s why I was so pleased to find that the Pentel gel pens I recently received lived up to their reputation for seamless lines, and actually made for a really fun couple weeks of doodling. 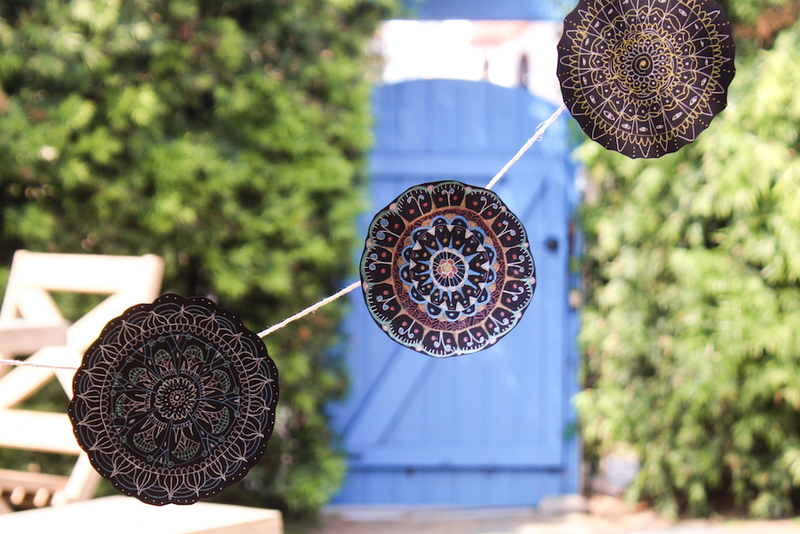 I think I may have actually taken my un-steady hand and made a fun tutorial that anyone can create (even kids, Scarlet had a blast making these) in the form of these gel pen mandalas, which I proceeded to cut out and turn into a garland. It’s looks difficult to do, but it truly is not. It’s actually rather zen-inducing. First, gather some black paper (or whatever color you like, but gel pens draw so well on black paper that it makes it extra fun to work with. 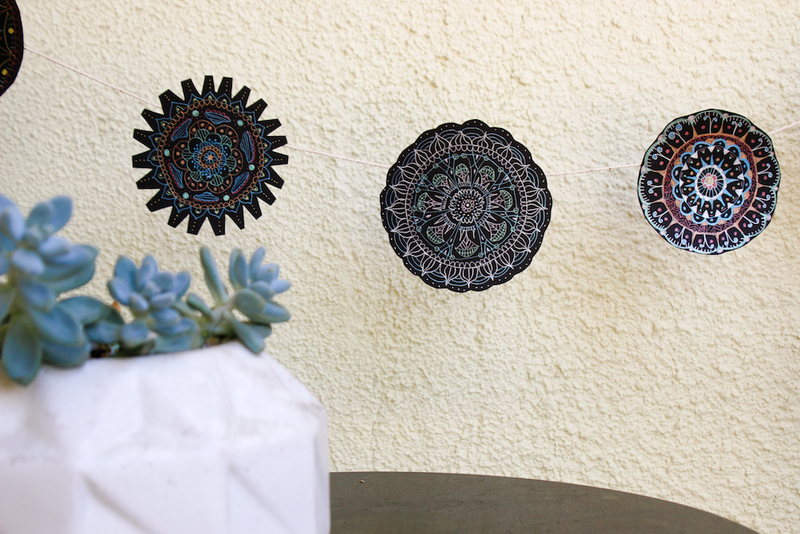 Use a heavier cardstock if you are going to string up a garland of mandalas. Then, you’ll need some quality gel pens. 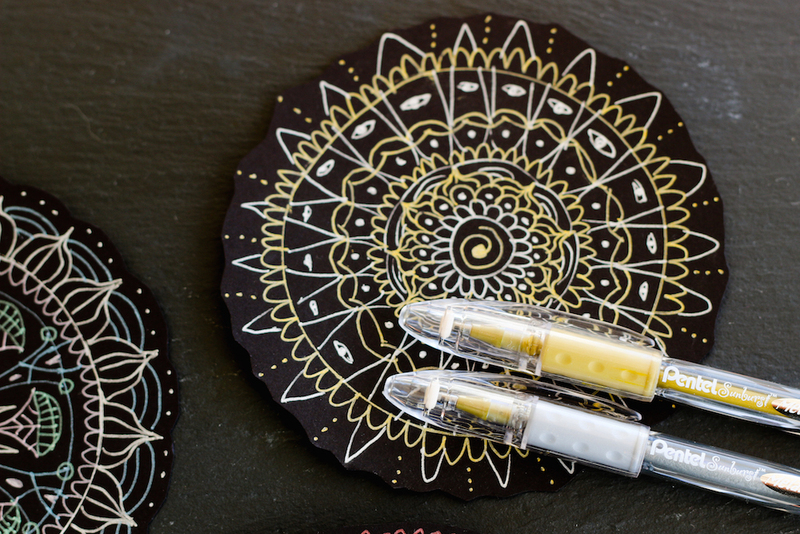 I adore this Pentel Sunburst set of two metallic gel pens, one gold, one silver. 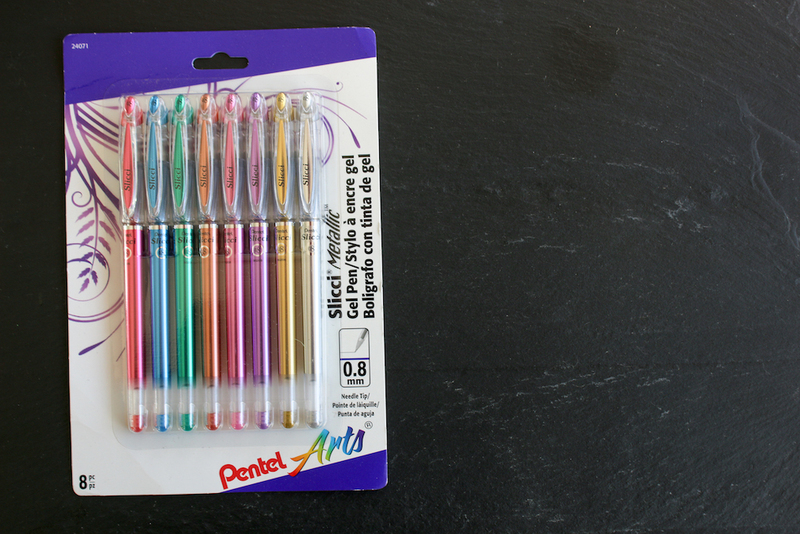 I also love the Pentel Slicci Gel Pens in a variety of metallic colors on black. They really pop! You start by simply drawing a dot of whatever size, and then surrounding it with some dashes, or scallops, or leaf shapes, or just whatever shapes come to you. 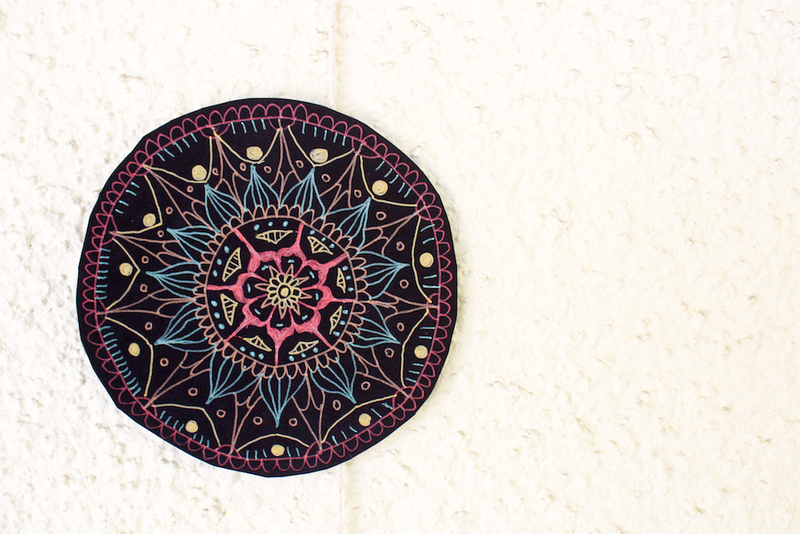 Turn your mandala as you draw, and mix up your colors for added dimension. 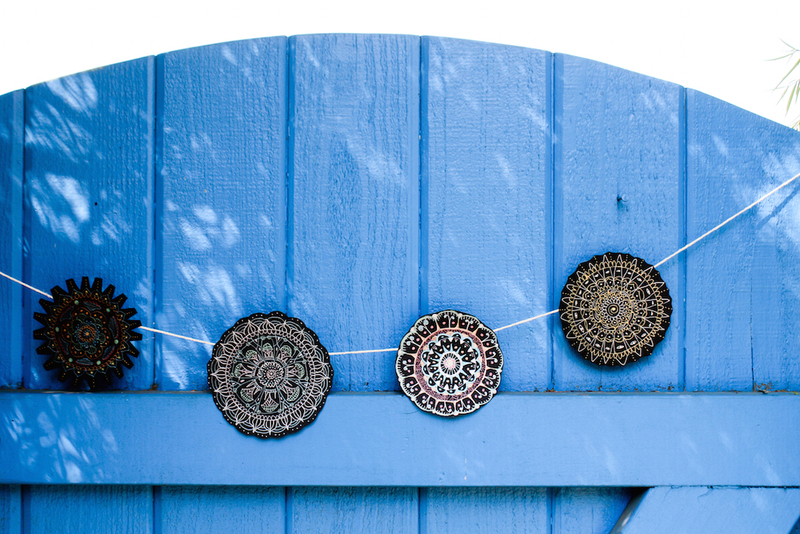 Your circles will likely be a little imperfect, and your pattern un-precise, but it doesn’t matter. Just keep going and building and all of the little inconsistencies will got lost in the larger pattern and add up to a charming mandala. 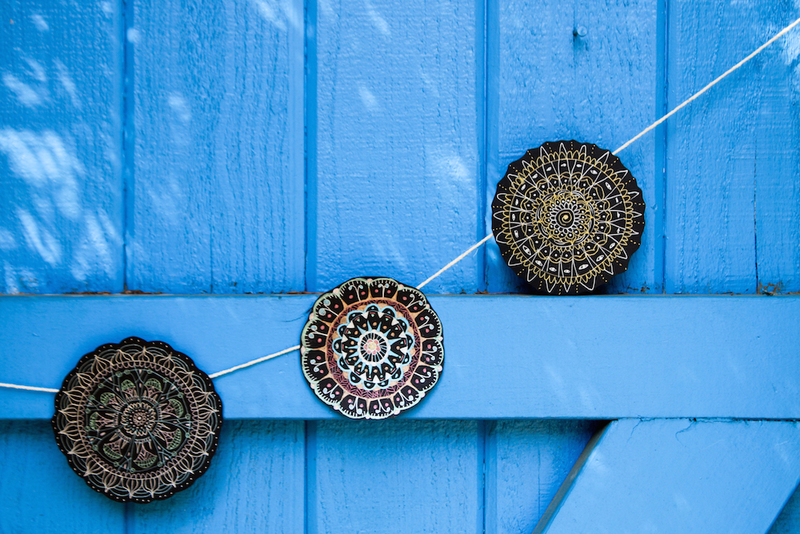 Cut them out just around the edges, then hot glue some twine to the back to create your garland. 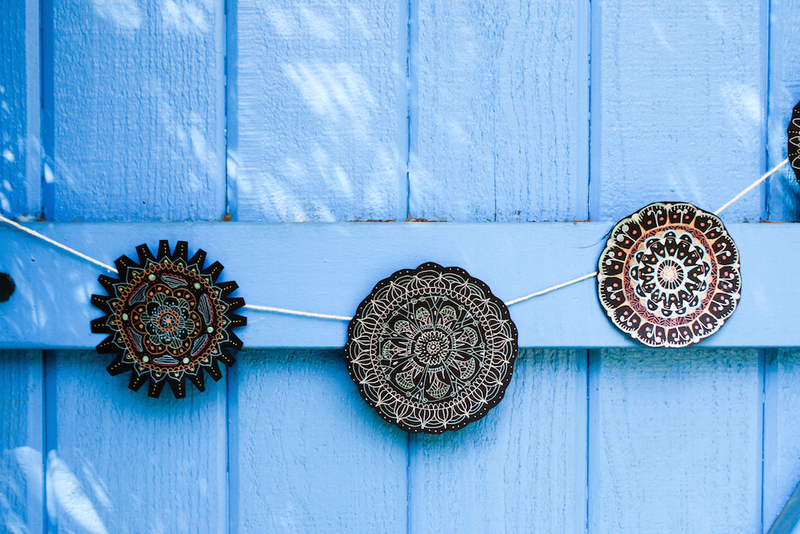 Hang them up wherever you need a little zen. This post was sponsored and inspired by Pentel. As usual, all opinions are my own. These are just gorgeous. I have to get my hands on some of these pens for important business work… and doodling! That’s a very cool idea, and thanks for explaining it so well…..a lot of folks can’t do that. Looks like a fun thing to try! And those Pentels look pretty awesome, too. Better add them onto my art supply wish list!